This cute and colourful 'Tweed the Bear' bone china moneybox is an ideal gift for any young girl. Ideal 1st birthday gift. 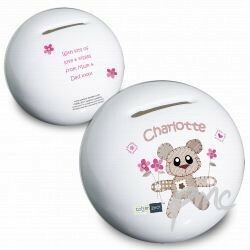 Personalise with the child's first name on the front up to 12 characters, and any message on the back over 4 lines and upto 20 characters per line.